I‘ve never been on a cruise before and to be honest I had never really thought I ever would, not for some years yet anyway – massive floating hotels with an ‘all you can eat’ theme – not really me to be honest. Then the opportunity to travel half way round the world to Fiji arose and when I looked at the brochure I realized how wrong I was, there is a thing called a ’boutique cruise’ you see and I had my eyes opened to a whole new way of experiencing some of the best landscapes, beeches, reefs, islands and coral reef conservation projects I’d ever seen. 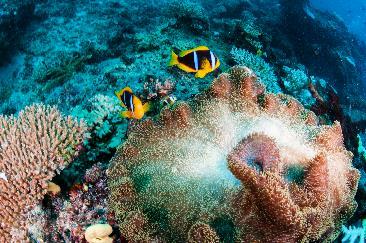 Superb snorkeling in the Marine Protected Area off Matamanoa Resort. I think it was the name that hooked me in: “Blue Lagoon Cruises, It’s where they filmed Blue Lagoon and Castaway” said Ellen the company’s rep who asked me to join the boat to take photos. “Really,” I said, “The actual island where Tom Hanks went mad with a basketball called Wilson?” She nodded and showed me pictures of a twin-hulled motor yacht, smiling Fijians and a beach with the perfect amount of palm trees. We chatted about the marine life, my camera and what I could do for them and to cut to the chase, I was going on a cruise, me… who didn’t like cruises! I’m so glad I did though, for someone fascinated by the oceans this was an absolute trip of a lifetime. After a long, but very comfortable flight with Air New Zealand from London and an equally long, but mercifully nighttime (though very comfortable) flight from LA, with Fiji Airways, I arrived at Nadi airport four hours and a whole day before I’d set off – I think (the International Date Line still confuses me). Nadi is a fascinating place and I’d suggest a walk round the market to soak up some local color: fresh fruit and vegetables, fish and the mildly narcotic kava root are piled high for all to see and if you ask permission the locals will pose for a photo, especially if you buy a papaya or two. Nadi (pronounced ‘Nandi’) market is a must see attraction. 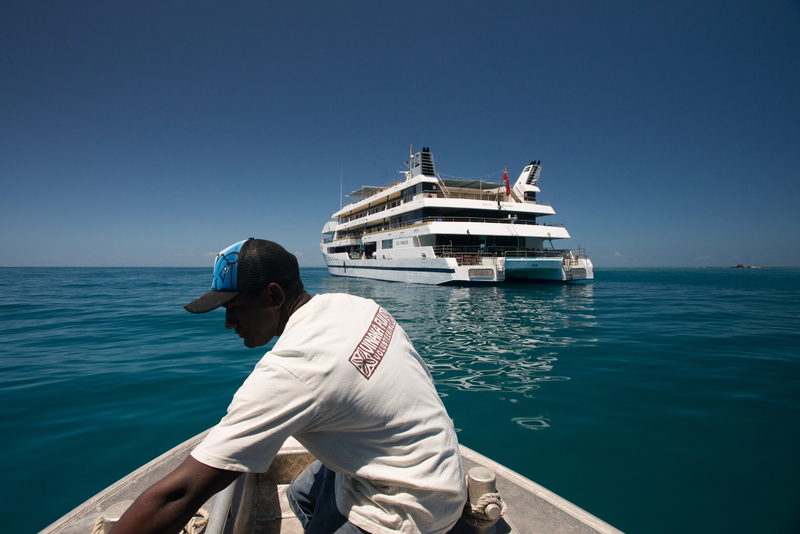 To get to the Yasawa and Mamanuca archipelago the best way is to head to the Marina at Denarau to the west of Nadi. This small harbor is well-served by the fleet of twin-hulled, fast boats that connect the far-flung islands. Denarau was once all mangrove swamp and I quickly had my camera out photographing one of my favorite environments, though I’ve often thought mangroves are best enjoyed when you have a really nice shower in your hotel room to return to after clambering around in the mud. Untouched forest near Denarau. It looks very wild and remote, but there’s a Plant Rock half a mile away. The Yasawas are a now inactive volcanic chain of islands, forest-covered and considered some of the most remote by Fijian standards. 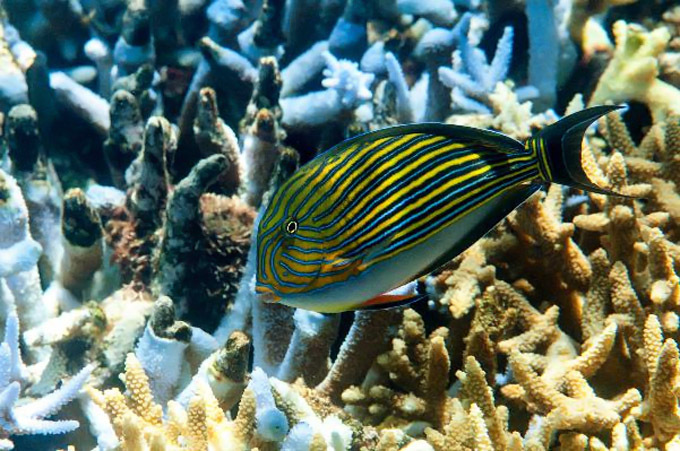 Set to the east of the main barrier reef complex, they are surrounded by relatively shallow waters and are every bit the paradise islands they appear. My home for five days was a ship called Fiji Princess, twin-hulled and with a shallow draft she is small by cruise ship standards. She can maneuver her sixty guests into shallow anchorages and within a few scores of feet of some of the best beeches in the South Pacific. I was clearly going to love cruising, despite my original prejudices. Fiji Princess, our home for the week at the first mooring. That first evening after locating my cabin I swam in the warm waters. I checked out my camera housing and took it down with me for a quick dip (it’s always good to know it has survived the baggage handlers). Much of the shallows was sea grass and I hunted in vain for seahorses before coming across a drop off and my first Fijian coral reef. 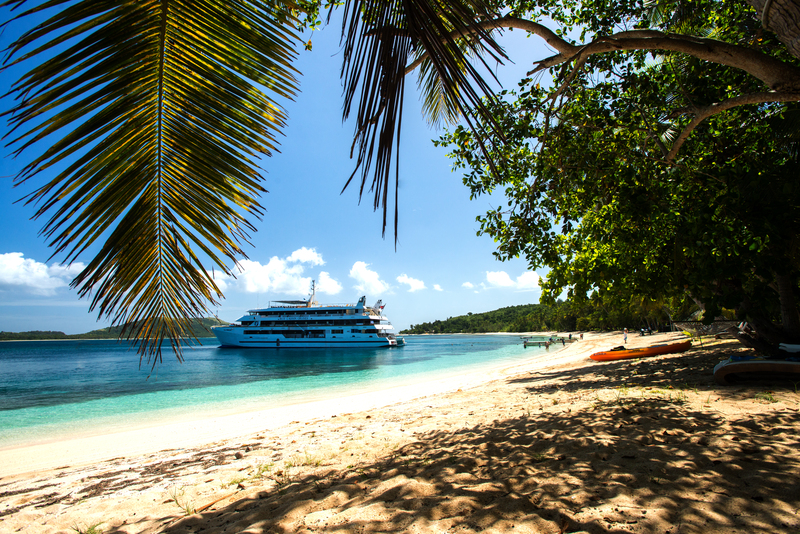 Fiji Princess at anchor for a snorkeling trip. I’ve been obsessed by the ocean since I was a small boy. I was bitten by the ‘salty’ bug when I fell in love with rummaging around in rock pools off the coast of my native Yorkshire. I knew I was always going to learn to dive at some point, once I’d worked out how to do that oft unpleasant business of working for a living. 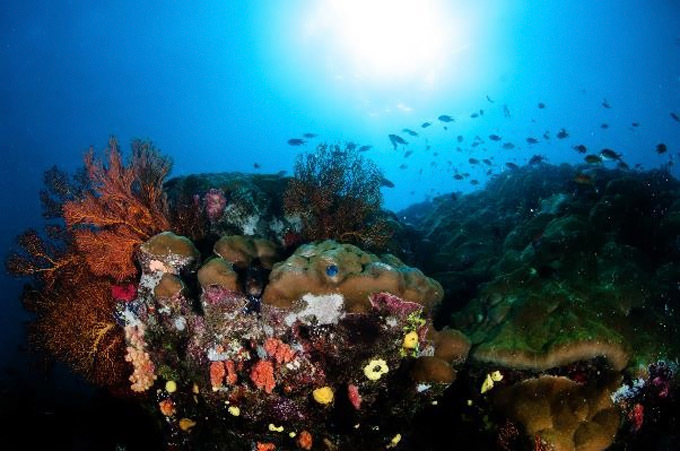 For me, diving and the wild oceans have always been a source of inspiration and as such have informed, guided and sometimes constrained my interest in captive reefs and seeing fish, corals and inverts in the wild to me is a no-brainer. If you can: enjoy the real thing. So with this in mind I duck-dived to see what I could see. 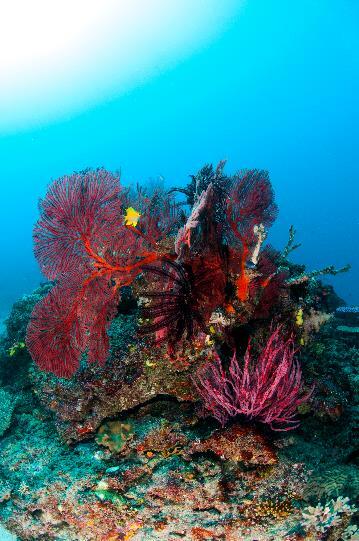 The first thing that struck me was the colors, some of the best blue Acropora I’ve ever seen. Whole colonies were delicate sky blue, others white with piercingly blue growth tips, all set amongst a huge amount of other, and mainly tabulate growths of Acro, with massive Porites colonies in and amongst. 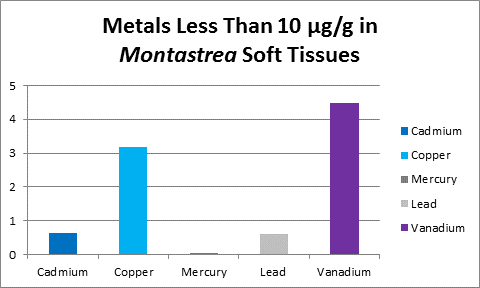 Pastel colors predominated and some sadly that had a look of bleaching. I checked my dive computer to see it read 32 degrees Celsius – this was quite warm. For me the shallows have always been fascinating, so I was quite happy bumbling around soaking it all in. 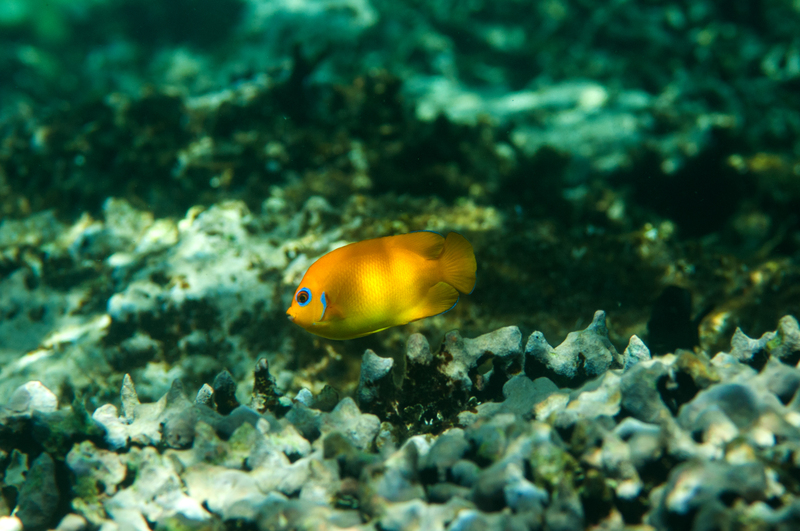 Fish life was plentiful and at this depth was dominated by corallivorous butterfly fish and grazing tangs, such as orange shoulder and blue lined. I found a cleaning station and watched as a small group of Blue-lined, (fully sized by the look of them), came past for a quick fettle. They eyed me suspiciously and I got the impression I’d upset their routine, but I could be reading too much into it. On the surface I could see the crew setting up for a meal so I headed back. 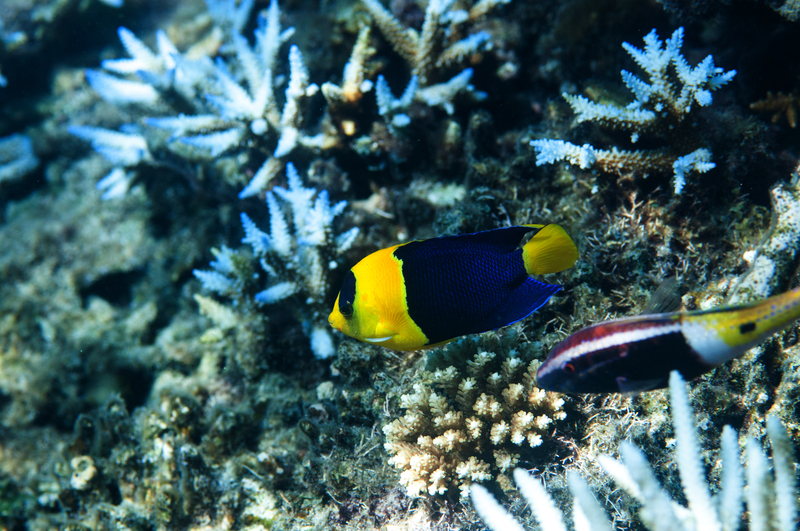 Seeing large tangs in single species shoals is one of the joys of seeing the ‘real’ reef. Convicts in beautiful blue acro. 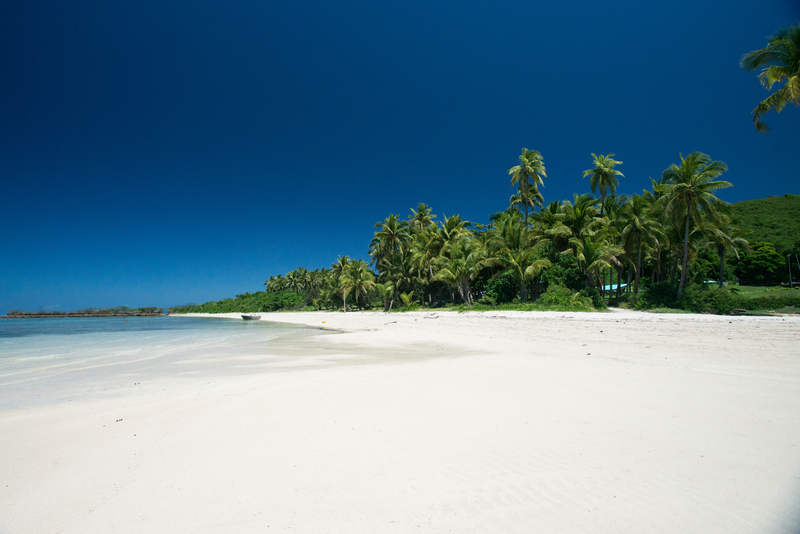 The sun was still hot as I sat on the beach with a rumbling stomach waiting for the meal that was cooked in the sand! Fish and chicken was wrapped in banana leaves and cooked from the heat of stones warmed in a fire. Whilst waiting, I got chatting to a chap called Brian from Brisbane “you’re gonna love it mate,” He told me with his fishing rod in hand. “I’ve been before and its sooo casual… oh look there’s the Captain in water.” He said as he pointed – a smiling grey-haired chap was splashing around with the rest of the crew – excellent, just my kind of laid back outfit! The next day would be a proper diving day that the Fiji Princess crew had organized for me. The Dive Center offered everything from beginner’s ‘Try Dives’ (which is a great way to venture into the water for the uninitiated) – to diving with Bull Sharks! The Bull Sharks were excellent and I saw six in total but that’s a different story. I’d set myself the goal of photographing the native clownfish Amphiprion barberi, I’d fitted a wide angle lens to my housing and was going to shoot the fish in their anemone hosts – easy I reckoned. The water was very churned up, some of the worst tropical water visibility I’d seen since monsoon season in the Maldives. 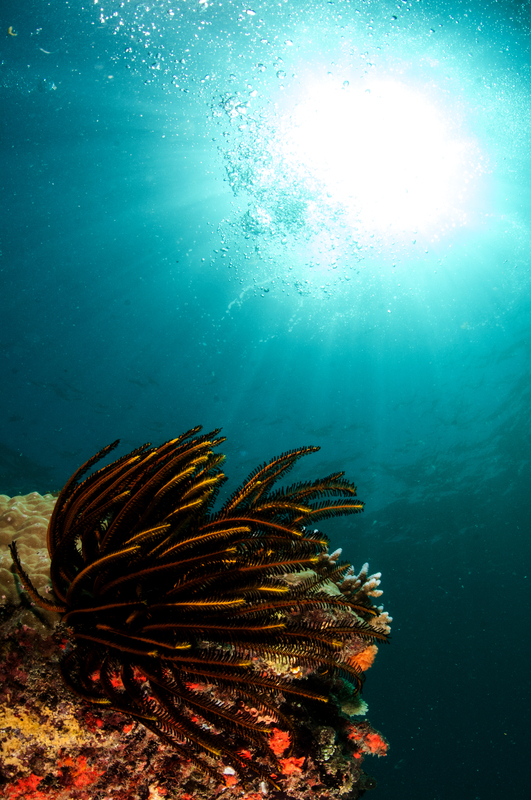 I was going to have trouble getting some great wide angle coral reef shots. Niko caught my eye and waved me over to a ‘nem, the clowns were Clarkii ones, not the single striped, redder fish I was after. I still managed to convey with gestures that I wanted my buddy to pose with them, though the wide angle shot does make them look larger than they ought. Still time to get the barberi I thought as I snapped away. The reefs on this site were a little sparser, fewer large corals and not the usual amount of sand and rubble you associate with a reef compared to the reef I’d snorkeled earlier. I suspect the regular cyclones that every few years hit these islands will scour the shallow reefs somewhat. The lack of good visibility was annoying me, but I realized the upshot of lots of particulates in the water was plenty of food for ‘filter feeders’ so decided to focus on the gorgonians, sea whips and feather stars that were very plentiful, perhaps this area was always a little ‘bitty’? Looking brown and almost black underwater my powerful flash guns illuminated the ‘true’ colors of the various gorgonians clustered on slightly raised areas. There’s a beautiful blue Christmas tree worm at the center of this image. A Golden Damsel looks good against the red gorgonian. At least one creature was benefitting from the particulates in the water. I always love spotting fish species that I’ve seen in aquaria, and this trip was no exception with Moorish Idol being plentiful and very healthy (not something that can be guaranteed in captivity I’m sad to say). I was also really pleased to see Lemon Peel Angels in the wild for the first time. 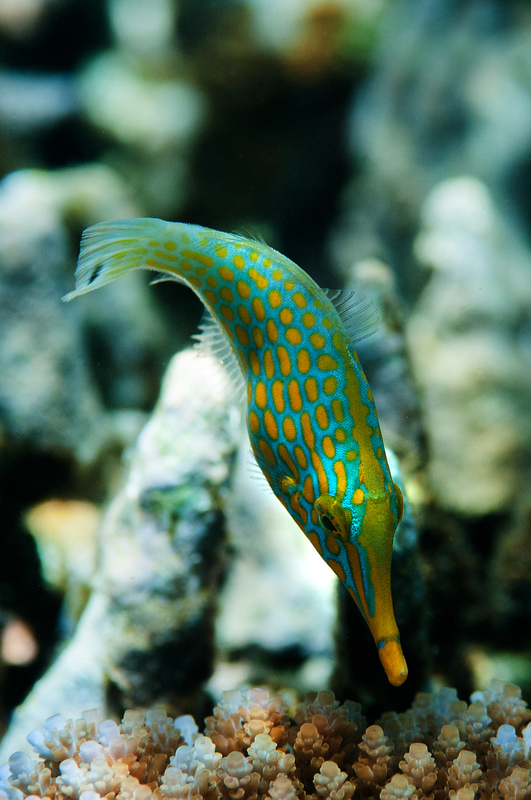 These beautiful fish have always been one of my favorites and look superb at depth with a very blue tinge to the light. I watched a pair for quite some time as they picked over growths of algae and a few coral polyps as they swam past. 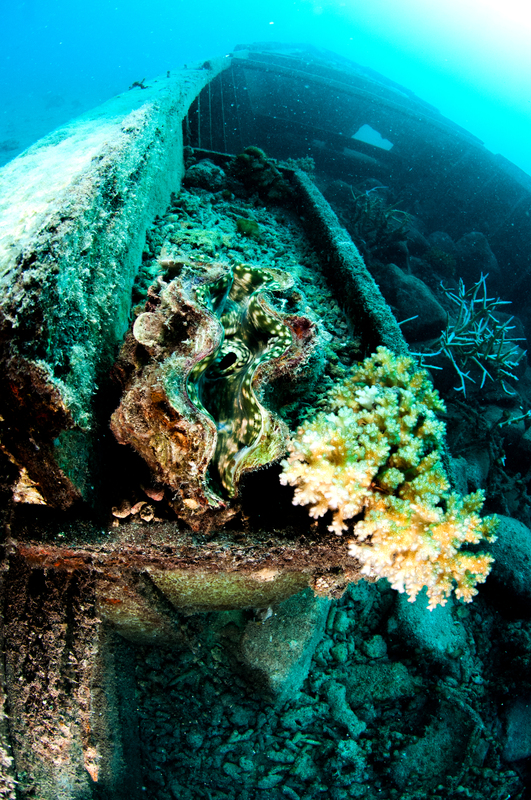 Interestingly, the specimens that I saw were more associated with rubble zones than areas that are rich with coral growth. I’m not sure if this is simply coincidental though. One of several Lemon Peels and a Bicolor below. That evening I spent time with Dan, a marine biologist from South Carolina who was working on a volunteer visa at a nearby island. 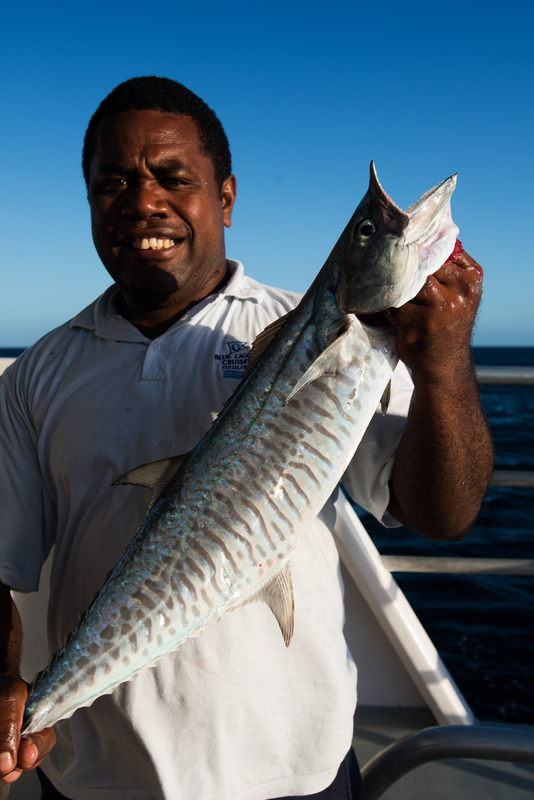 He’d come on board to talk to the guests about the conservation work that he was leading in the Yasawa Islands and to tell the guests about the issues facing the coral reefs. He noted the benefit that tourism can bring in terms of resort islands closing their waters to fishing to encourage snorkeling and diving amongst the relatively rich tourists, but told us that the downsides of this that many local ‘shell markets’ still feature species like Triton’s Trumpet and various Tridacnids. Both are covered by CITES and will be confiscated if found, but most tourists are unaware. 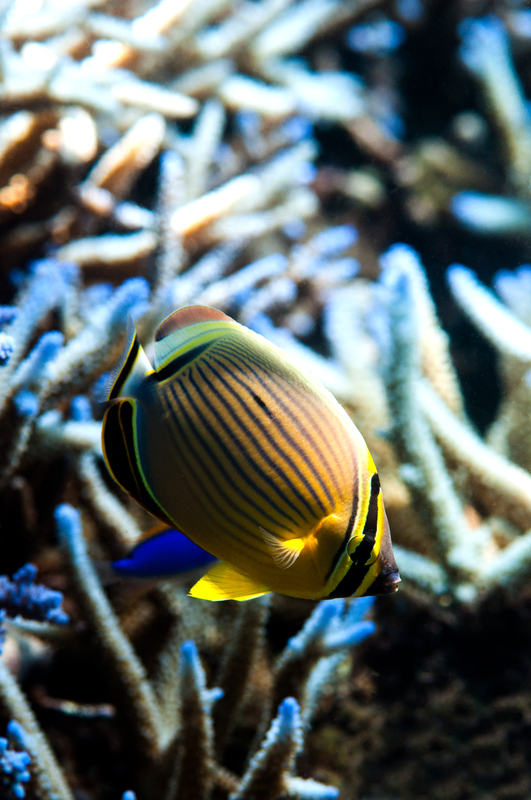 Most are also unaware of the threat of Crown of Thorns Starfish and the fact that Triton’s Trumpets are direct predators on these troublesome echinoderms. Dan and I chatted about this and he told me they were farming clams to keep the crown of thorns in check. A clam farm! I thought… I had to see this. 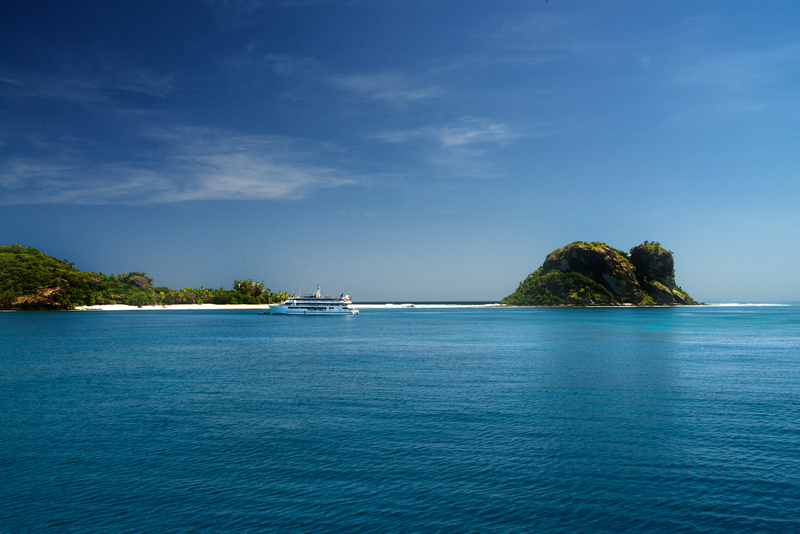 Blue lagoon Cruises have clearly understood that seeing the underwater world is a key part of their offer to travelers, so there are regular dive trips available, along with the daily snorkeling sessions of course. I quickly booked for the next day and agreed with Dan that we could have a full dive on the reef like any other visitor, but then take in the clam farm as well. Dan’s work is funded by a project called Vinaka Fiji (‘Vinaka’ means thank you), which receives its funding from the Yasawas Islands Trust, which was set up to say ‘vinaka’ to the locals and to invest some of the profits from Blue Lagoon Cruises’ (and associated businesses) into the local villages, the local people and the environment and I was pleased to know that my presence in Fiji was benefitting the region and its people, who were all incredibly welcoming I might add. The next day we were picked up from Fiji Princess and a short ride on a bouncy wee boat took us to the dive center on Barefoot Island, where Dan was based. 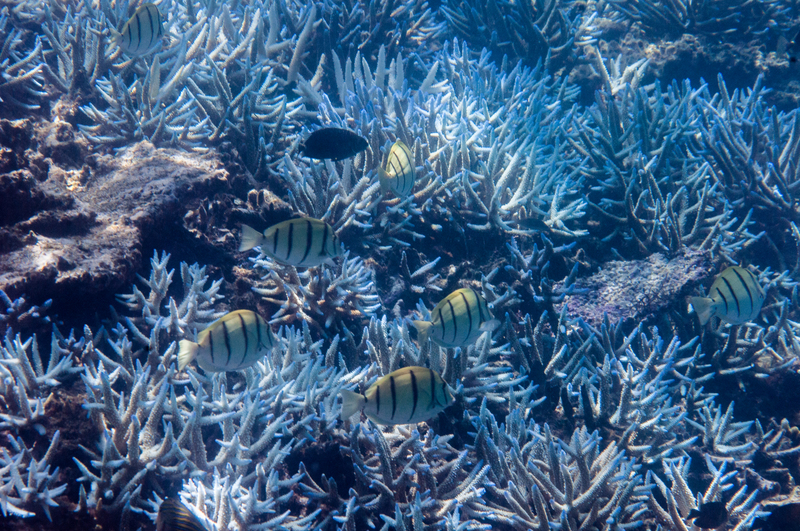 The visibility here looked much better and as we descended into the warm shallow water at a nearby reef – a series of coral canyons filled with white sand – I realized I could see so much more coral. Some was looking a little bleached, after the very warm summer, but much was in fine fettle, with superb pastel colors and lovely growth. 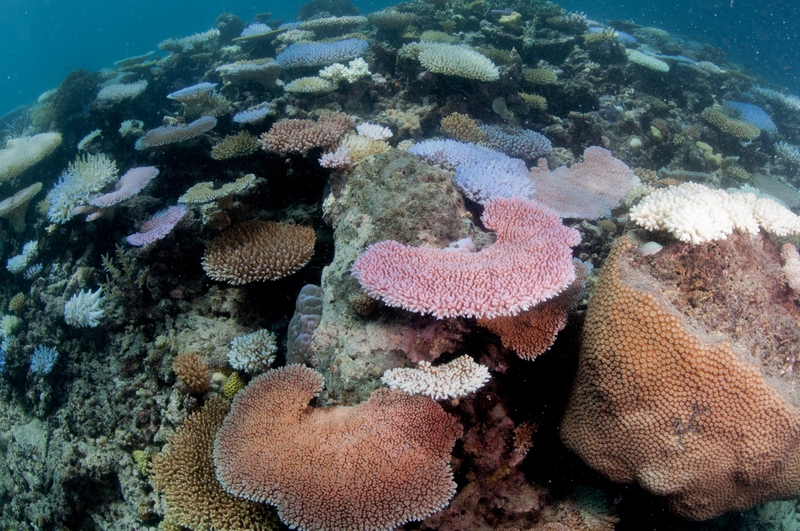 It was clearly a while since a storm had ripped much of the tabulate corals to shreds. 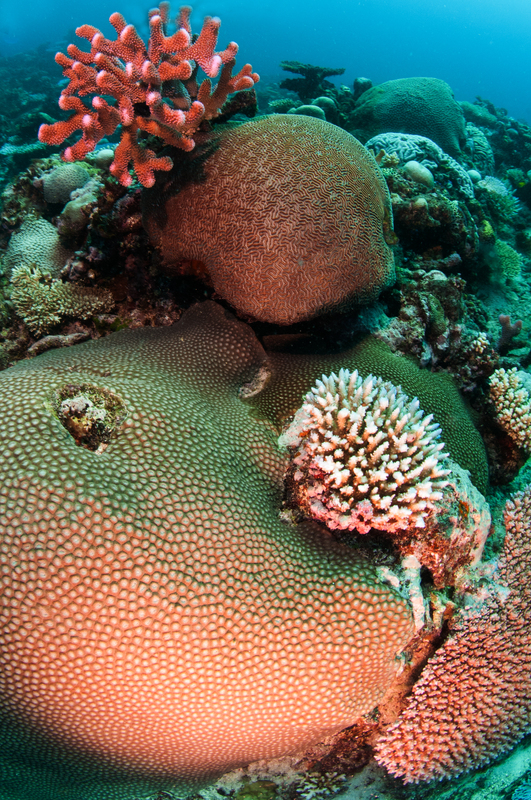 This Turbinarea was astoundingly massive, the entire coral was around ten meters across. In the UK we have houses smaller than this behemoth. 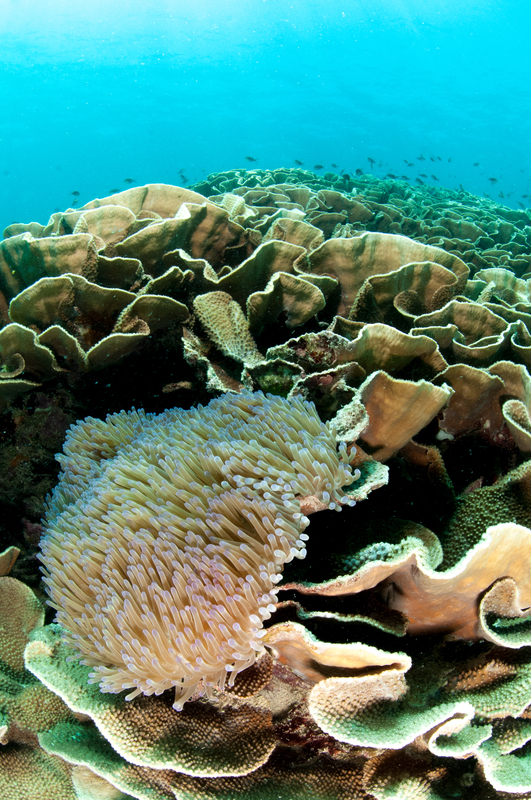 The coral has given its name to the area and is now called ‘Cabbage Reef’. For me though, it was all window dressing and I just wanted to see the ‘farm’, which appeared to be set in an old boat! At around ten meters, filled with rubble, was a wrecked old wooden boat and sat amongst the coral boulders were some of the biggest Tridacnids I’d ever seen. The clams are kept free of algae. 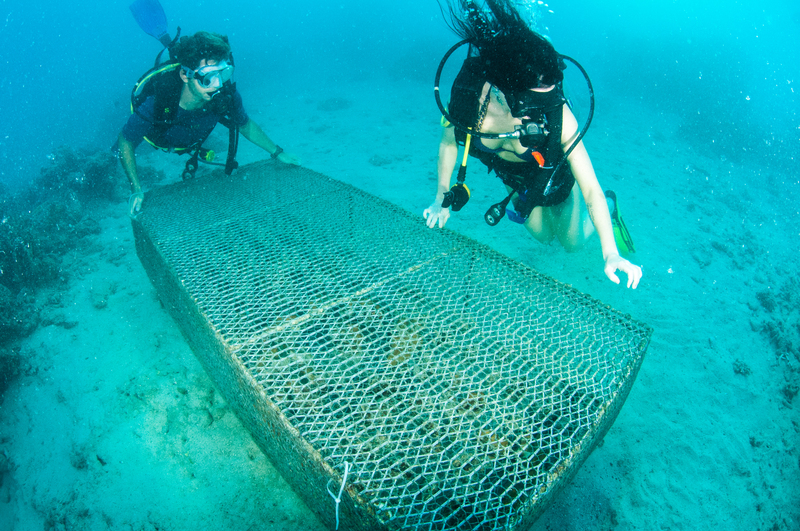 Close by the boat was the cage where smaller specimens were kept. I asked Dan later why they were kept in a cage. It turned out that clams not ‘grown’ into the reef are much loved by the local ‘naughty’ octopus (his words not mine). Back on shore Dan told me they were keen to increase the number of clams as they were important in filtering out the free=swimming larval stage of the crown of thorns stars. I have to say I’d never heard this, but it sounds very plausible. 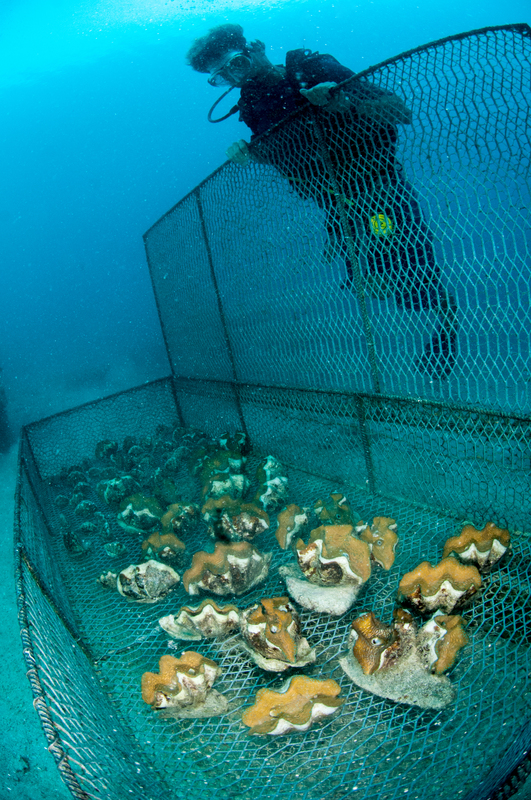 The clams need to be cleaned every few days by volunteers with tooth brushes as their shells are not grazed by herbivorous fishes excluded by the cage and can be quickly overgrown by algae and other organisms. 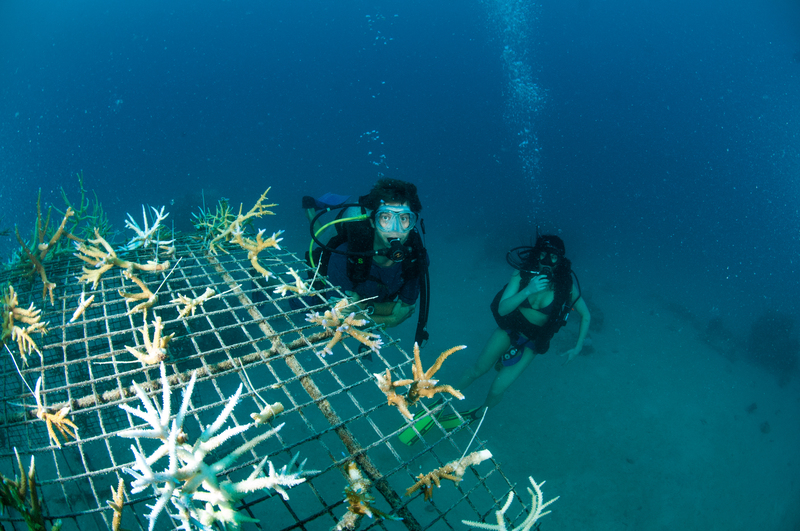 A recent project the tam have undertaken is a collection of coral frags that will form the basis of ‘mother’ colonies that will be used to create new reefs and increase the diversity of existing ones after crown of thorns out breaks. If I’ was several decades younger I’d be volunteering to help on this project. 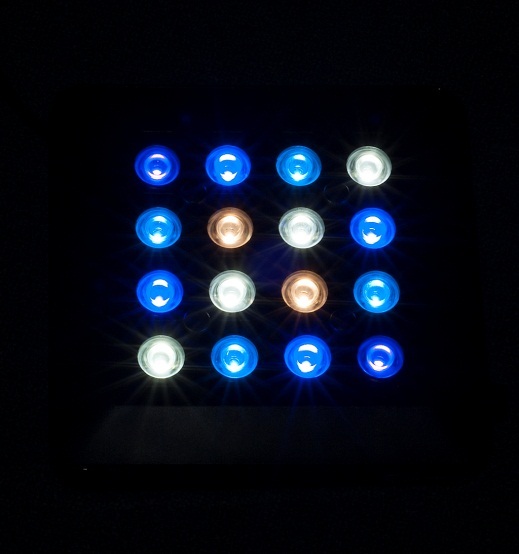 A newly created group of potential ‘mother colonies’. The next day I enjoyed the beach, watching the shore-based hermit crabs and looking along the drift line before taking yet another snorkel over an algae dominated shallow fringing reef – still no seahorses! 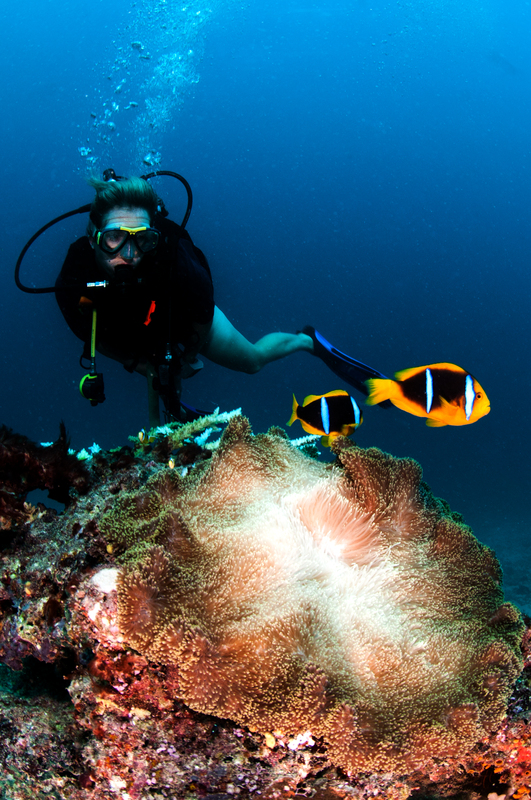 Over the course of the four days I was aboard Fiji Princes I think I snorkeled twice a day and enjoyed five dives. 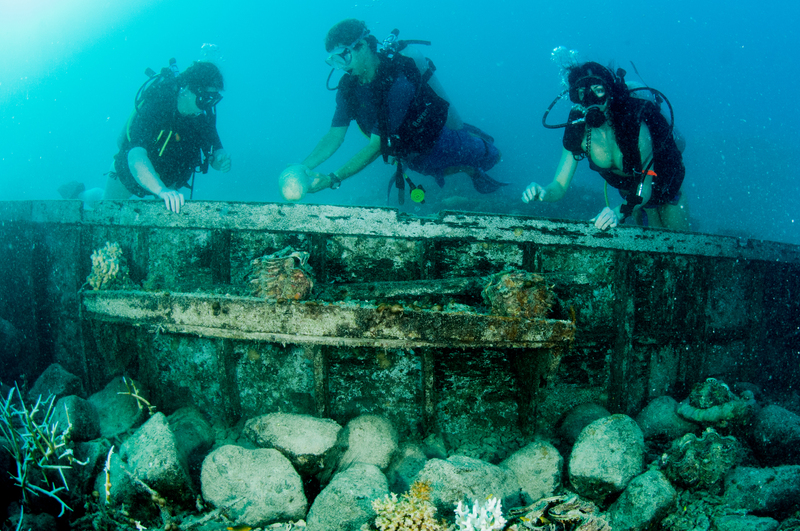 The itinerary though isn’t just about being underwater – though for me it was a big part of it. Guests can swim in a freshwater canyon lake inside a limestone island, visit several villages and eat with the villagers, as well as visit a local high school to meet some of the best behaved seniors I’ve ever met. 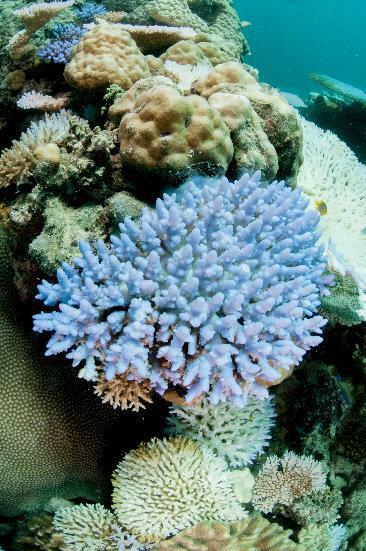 On land you can visit the markets of Nadi, other villages and even an orchid garden that was once owned by Raymond Burr (yes, he of Perry Mason fame), yet I must bring this article back to the reef and the ocean. Fresh fish is caught daily. I adored being on the cruise, the food was stunning, very fresh (and frequently caught) and there was so much to do that it’s hard to get it all down. My itinerary was for four nights, and I wish it could have been longer. 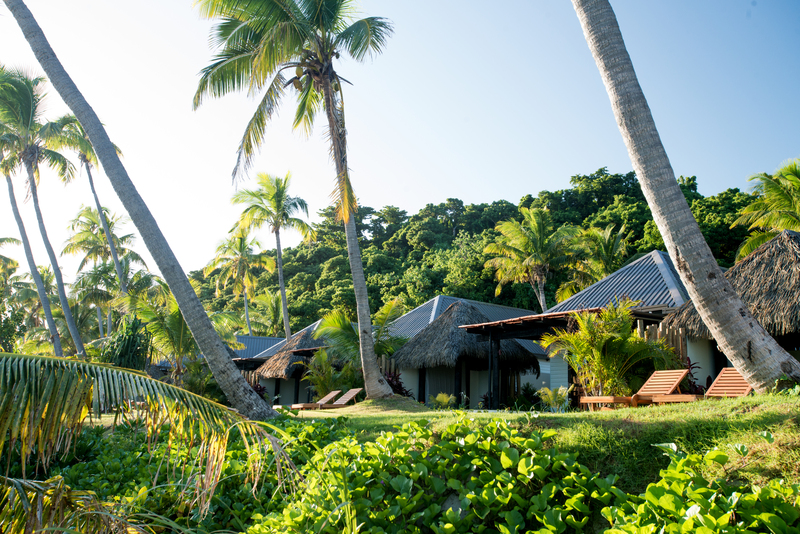 My final days in Fiji were spent on land at the Matamanoa Island Resort. I could talk about the resort’s stunning restaurant and idyllic setting, but I should come back to the ocean I guess. 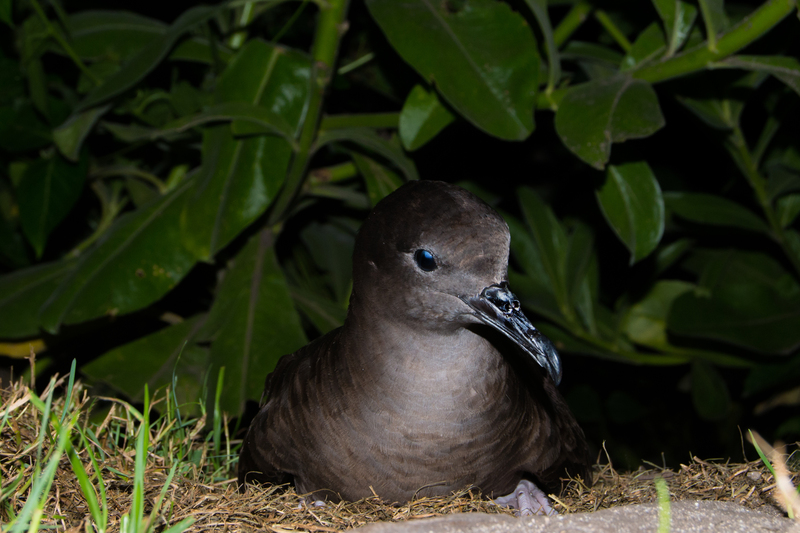 I’d add though that the resort shares the land with a very rare seabird (a type of shearwater), that live in burrows and make a slightly eerie, yet strangely calming call on a night. Wedge-Tail Shearwater or Puffinus Pacificus. Many native birds in Fiji are threatened by land use change and introduced species such as rats and mongoose. 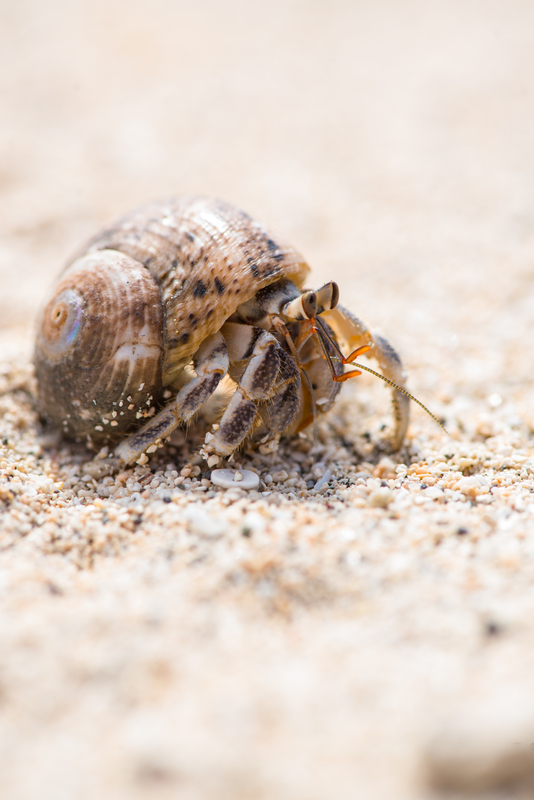 Land-living hermit crabs arte highly entertaining. More great snorkeling off the beach at Matamanoa. 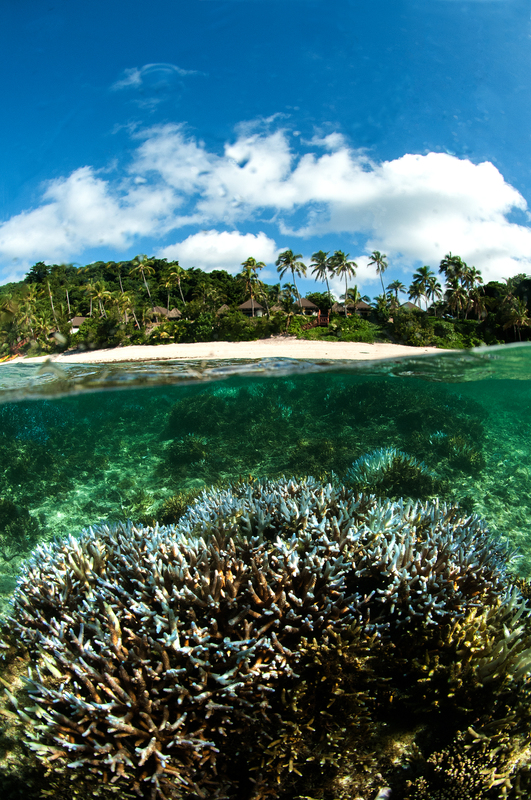 Like many resorts in the region, Matamanoa’s waters have been declared as a marine protected areas by the local chief (only Fijians can own land in Fiji, so may resorts are rented from the local villages). I’ve often felt that if a healthy reef earns more tourist dollars (any dollars for that matter), than a damaged or overfished reef then a small victory has been won, and indeed the snorkeling here was superb, with large shoals of tangs, small haremic groups of bicolor angels, plenty of mixed butterfly fish and even a small black tip reef shark, but still no barberi clowns. 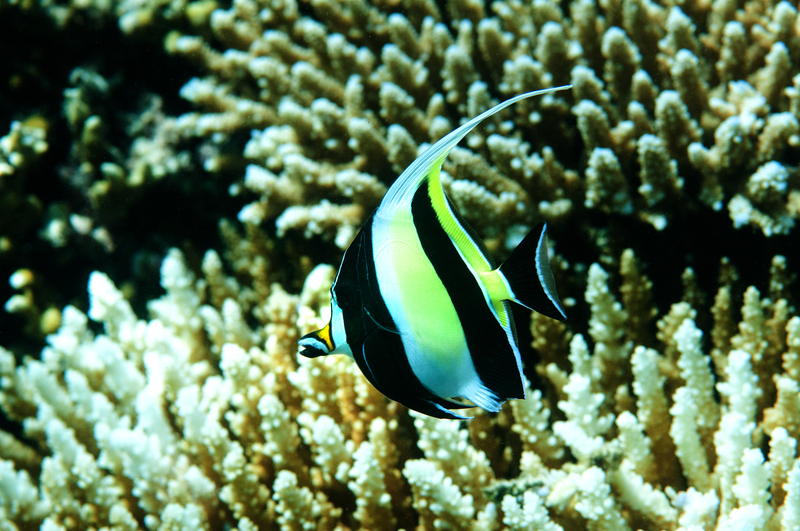 One of my favorite butterflyfish. 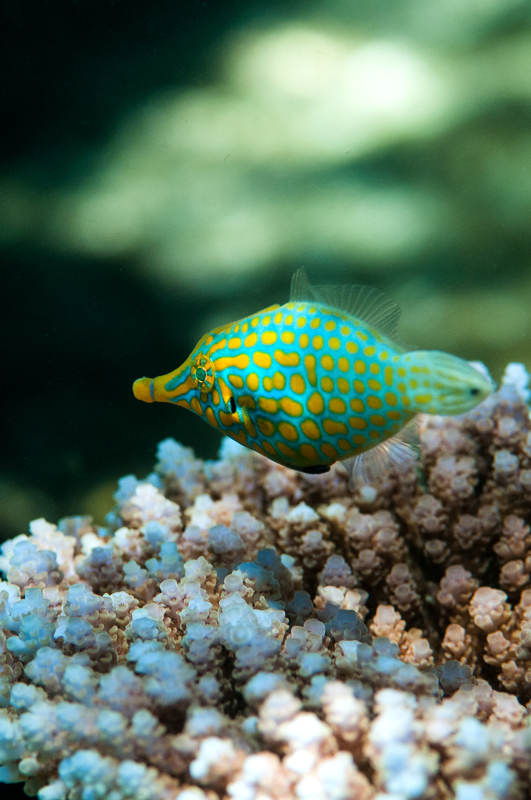 It was at this point that I decided to ditch the clowns and my desire to shoot them – because I’d seen plenty of orange spotted file fish in the shallow water – I’d pretend instead that they were my goal all along and I’d be happy once more. 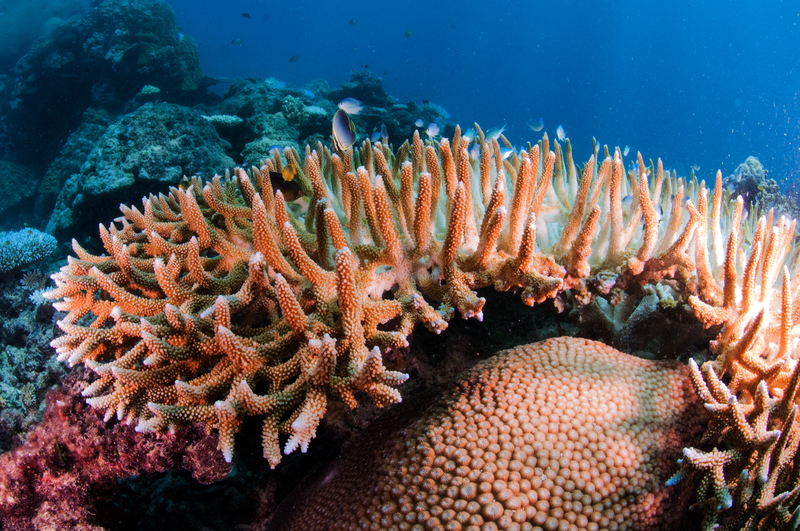 Now, I’m a little plumper (and consequently more buoyant), than I would ideally be and snorkeling with a large professional dive camera is not easy, especially in two meters of water over delicate Acropora. Instead of slowly drifting after my prey I tended to flounder around a lot, getting sun-burnt and very frustrated – however I finally managed to get a few decent shots – the first I’ve ever taken of this magnificent fish in the wild. It’s hard to explain just how much I enjoyed this trip and just how much I recommend it to anyone with even a passing interest in the underwater world, though I’m trying I guess. I flew from London Heathrow to LA with Air New Zealand (www.airnewzealand.co.uk/) and then to Nadi with Fiji Airways (www.fijiairways.com/). Prices range from US$400 to US$2,500. Blue Lagoon Cruises (www.bluelagooncruises.com/). I did the four day Wanderer Cruise: www.bluelagooncruises.com/cruise-itineraries/wanderer-cruise/ other itineraries are available. 4 nights from 1 April 2014 to 31 March 2015 FJ$2,660(Hibiscus Deck) and FJ$3,400 (Orchid Decks) per person for a double/twin cabin. 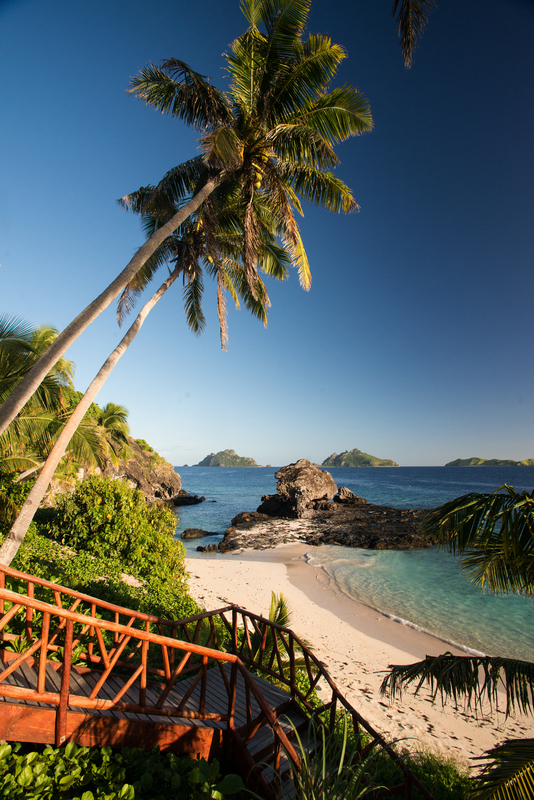 The Yasawa Trust Foundation was established in 2010 and created the ‘Vinaka Fiji’ Volunteer Programs in Fiji’s remote Yasawa Islands. The aim of these programs is to improve the provision of basic needs and amenities missing from village life in the Yasawas. Vinaka Fiji invites you to share the magic of Fiji whilst helping the people of the remote villages of the Yasawa Islands. Their volunteer programs cover key areas of need, from helping children learn, to planting crops, installing water tanks or working in baby clam nurseries. Program length is flexible from 1 to 26 weeks, and the range of opportunities to help means there is something for everyone.